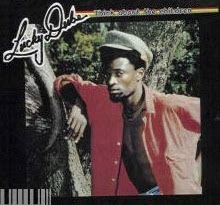 Lucky's second reggae release. Heavy use of synthesizers instead of traditional instrumentation would be the key to his signature sound and arguably his worldwide success for the next two decades. Frequently making use of his falsetto vocal skills, Dube indulges in a quintessential bubblegum sound, straddling both mbaqanga and reggae in a way that no one else ever managed, or even attempted. Highlights include "I Will Never Fall in Love"(featured on the Afrosynth V: Still Burning mix) and "I've Got Jah". Later re-released on one CD with 1984's Rastas Never Die, Think About The Children features more sophisticated programming and instrumentation than its predecessor.